Under the Affordable Care Act (ACA), adults 18-64 years of age must have health coverage. Without it, you may pay a tax penalty. Maryland Health Connection helps families enroll in coverage both online and in-person at four locations throughout Montgomery County. Enrollment is simple, so take time to learn more today! The Capital Region HealthConnector’s Open Enrollment Flyer explains what you need to do in order to enroll in health coverage under the ACA for 2016. A variety of health plans are available to fit most needs, and some families may be eligible for free or low-cost coverage. 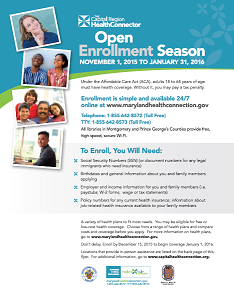 To begin coverage on January 1, 2016, you must enroll by December 15, 2015.